I am a happy but restless soul. I began my humble life in a traditional Amish community, and have since become a globetrotter. It has been a fascinating but relentlessly exciting journey. Here you will find reflections from the past, current adventures and ramblings of the future. Welcome to my life. 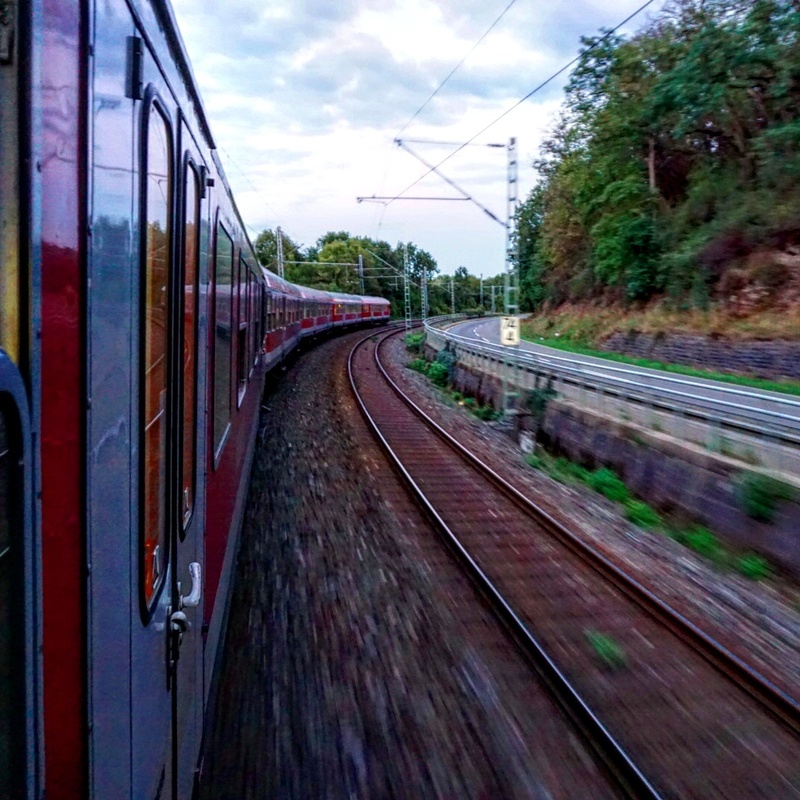 I took a nice dark red Austrian Railjet train from Munich Germany to Budapest Hungary. It is really not that far. A scant 8 hours, made especially nice by the fact that there were no border crossings to take up lots of time. 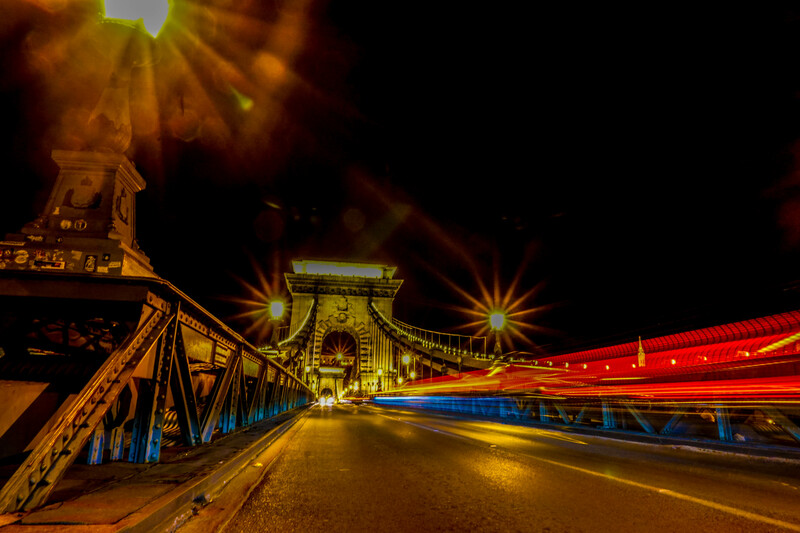 I had only one night here and I had two objectives: visit the Citadella and the chain bridge. I took the new green line metro underneath the Danube river and got out, ready to climb the mountain. 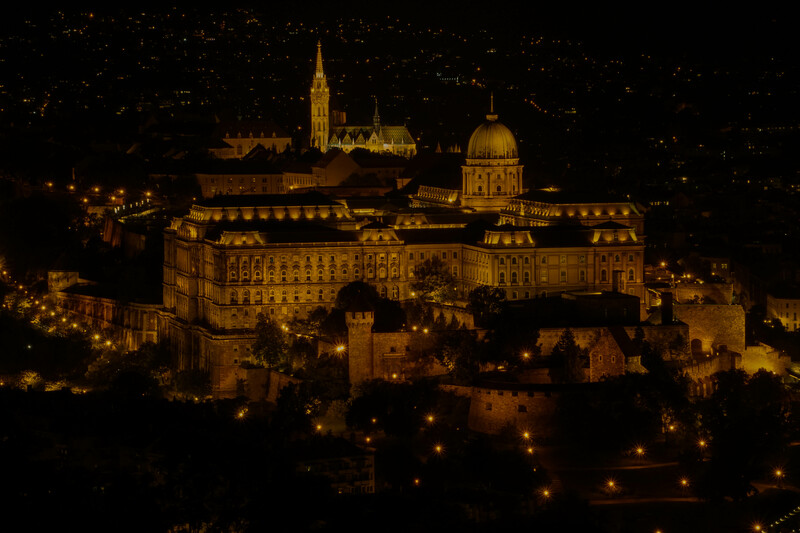 The Citadella is an old fortress on top of a steep mountain in Budapest. It’s about a 30 minute climb, but first I needed some food. I found a Hungarian pizza place but they were ‘take out’ only and didn’t really know what to make of this guy who stops in trying to buy a pizza. They fetched someone out of the back that could speak a bit of English and I ordered a pizza. I carried it with me up the mountain and had a picnic in the dark. 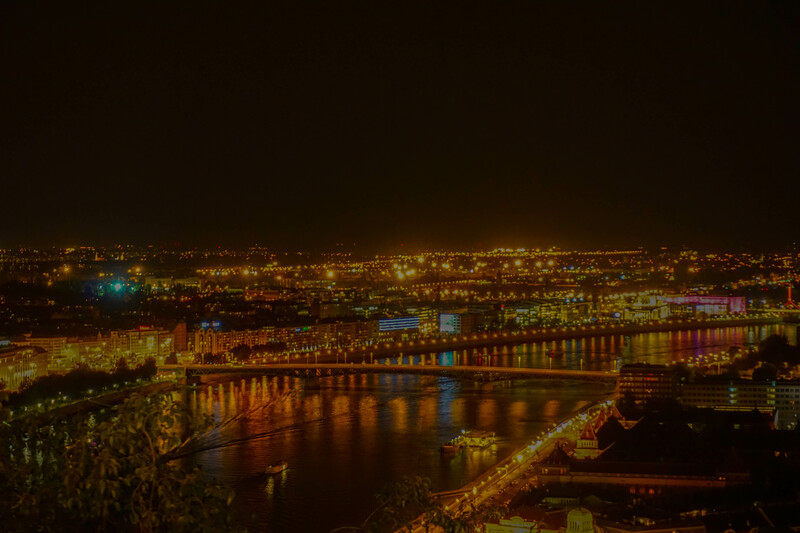 Budapest is the pick pocket capital of the world. [So I heard once.] Three years ago I climbed this mountain and somewhere in the deep shadows I was waylaid by a man who tried to take my wallet. I felt it and wasn’t about to give up so easy. Something of a stare down and a small fight ensued, but when I had regained my wallet I galloped down the mountain, with a grungy rough shaven thief in hot pursuit. I escaped. So, for me to venture up this mountain in the dark with no lights was facing my fears. I admit I was very cautious and every time I saw a shadow I wondered if it was someone who wanted to relieve me of money. No incidents occurred. The view from the top was breath-taking. 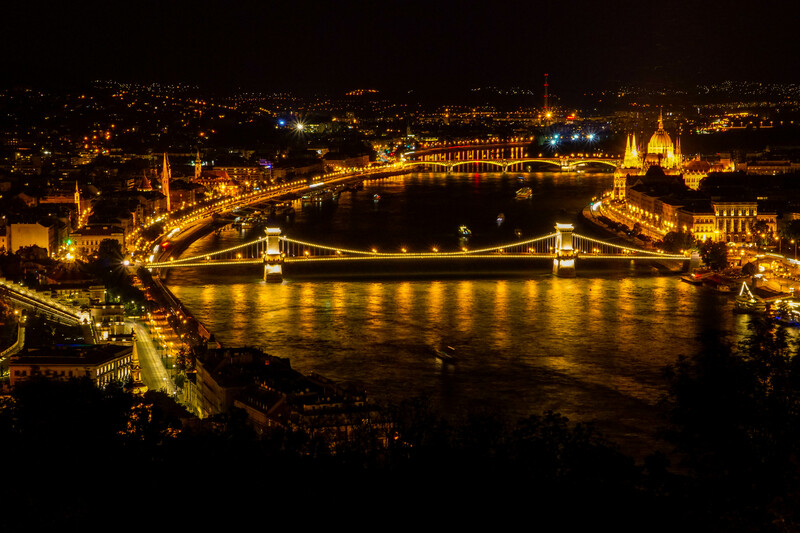 The entire city sparkled with a million golden lights, and the Danube stretched both ways as far as the eye could see. Boats made their slow laborious way up and down the river. From there I went down to the chain bridge which is a properly magnificent bridge. It was the world’s first suspension bridge and was quite a marvel in its time. I spent some time sitting by the river thinking and meditating. At 6:00 the next morning I was back on the train. This time it was a Hungarian MAV train and off we went. 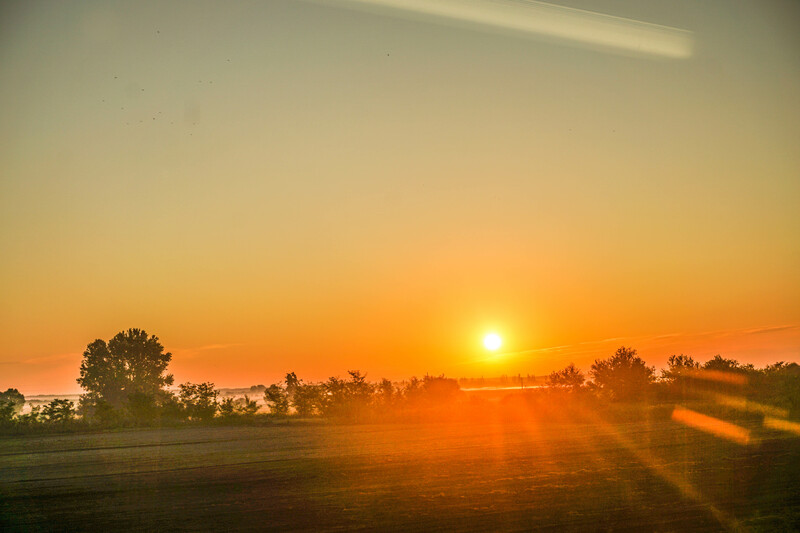 Daybreak came shortly afterward and I was treated to a gorgeous sunrise in a foggy farm area with rolling cornfields. This has put me on a journey. It has put my mind on a journey. I have been practicing this truth in a society that tells me the opposite. Society cannot bear unpredictability. It can not handle wildness. We have tamed everything and made it predictable. We become Christians at 16. We get married at 21. We have kids. We don’t do anything risky. We don’t smoke. We don’t drink. We don’t dance. But what about our hearts? Are they as clean as our lungs and liver? Is there room for the blessed Father in there? Are they free and happy or sad and dying? Then we get older and we wonder where life went. I would like to propose that we think outside the box. What if God is wild? What if life is meant to be unpredictable? Would we be okay with that? And it’s been good. I wouldn’t trade these experiences for anything. I think back to the first time I met God. Behind the chicken house in southern Kentucky next to a putrid drainage ditch. (My brother and I renamed it Little Chicken River because we wanted adventure.) Then I ignored God. For many years. Besides, I didn’t know what to do with this experience. Then seven years later when my life was spiraling out of control He came again. 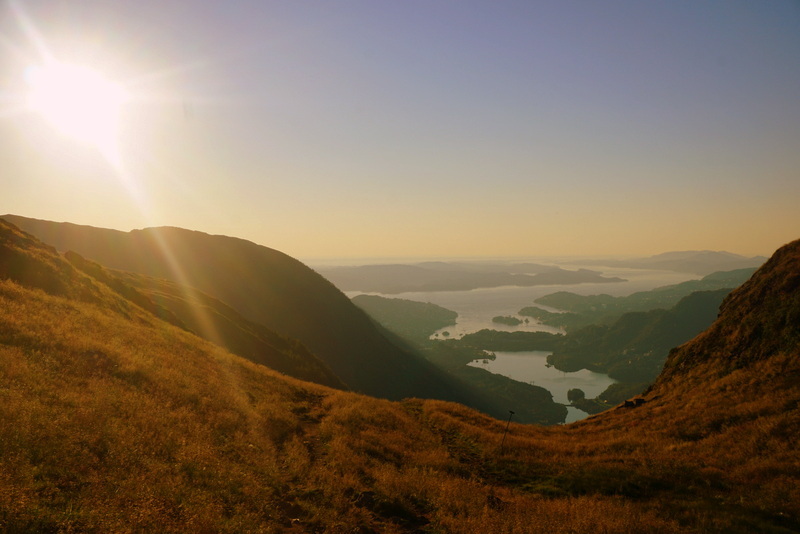 He met me in a powerful, life-changing way that set me free and gave me courage. I left everything. Only to get sucked up in another system. To find healing from this, God led me on a long journey through Europe. I couldn’t say why I was going and I thought I was crazy going for a whole month. My comfort was that I had enough money to by a ticket back anytime I wanted. Instead the day I came back was the worst of them all. I wanted to cry. And I learned to know myself. I found myself. I discovered that God is big and wild. Unprogrammed. And He wants to be discovered. It was a month of hurts and fears draining from me and being replaced by confidence. By knowledge of being the beloved son of God. I vividly remember the profound moment that God met me on a smoky local train lost in central Bosnia in the middle of the night. I was standing beside the open window as we chugged along. It was a brilliantly clear night with stars sparkling so brightly I didn’t know what to do. And God touched my heart. I had found so much healing and this was like a final touch. It brought tears to my eyes. It was like a giant hug from God. Over the years I have traveled here and there again. I have taken about 70 plane rides in the last 20 months. But I prefer train when ever possible. Because I find time to relax, unwind, and hear from God. To talk to him. It’s like our special place. 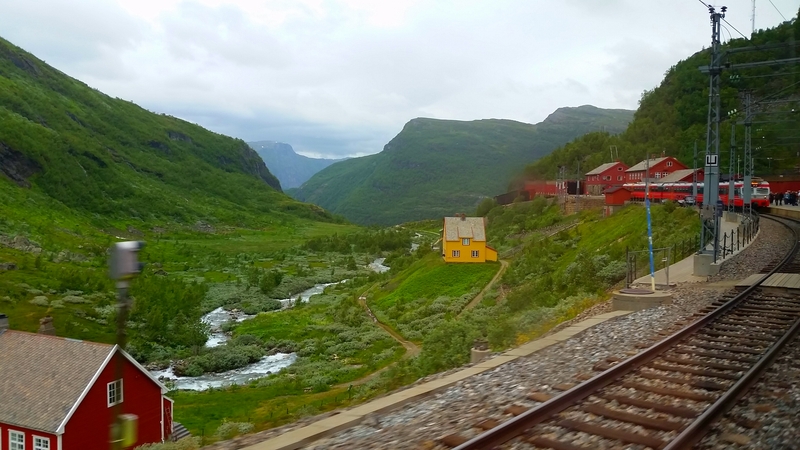 I have so many good memories of train rides across places like China and Australia. 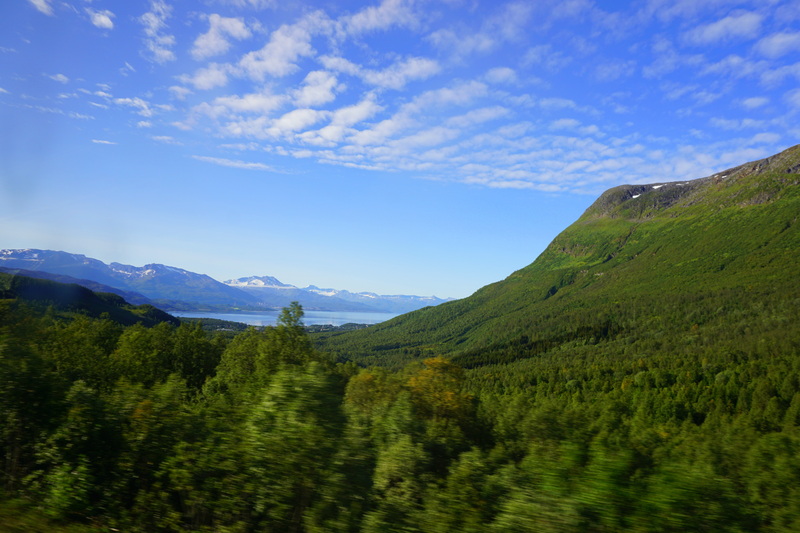 And that is why I chose to take the train from northern Norway to southern Germany. Yeah, its over 2000 miles and it takes 3 days and 2 [miserable] nights. But God comes and talks to me every day. It’s a hallowed spot. Yesterday it was mostly me talking to Him. Asking so many questions. And today it was Him talking to me. He said,”I know you have questions. You want answers. But you need to trust. Life is meant to be mystery. It is meant to be wild. If it weren’t you wouldn’t need Me. Because you have chosen to live from the heart. And we are going to share the adventure and the journey of life you are on.” And my heart was so full I didn’t know what to do. Except, whisper thank-you as warm, salty tears pushed at my eyelids. And I knew as never before who I am. Now isn’t that pretty cool? God wants to share our lives. I have come to believe that he wants to be deeply involved and personally share in our adventures. He wants to be right beside us in whatever we are doing or pursuing. You know how the first thing we all do when we wake up is to reach for our smart phones? You know how broadly we smile when there is an email waiting from that dear friend who is 6 hours ahead of us. Do you know how much God would like it and how broadly He would smile if we woke up and talked to him before leaving the covers? Not to mention before we even touch that smart phone. I also believe that many times we neglect to realize that God has created us uniquely. Those desires he placed in us may be something He wants us to explore, to follow through with. Honestly, I feel very vulnerable sharing this. But I have to. Because then you expect be to keep living this. It creates accountability. And perhaps there is a soul who is wondering how to connect in a deeper way with God. Please don’t read a book. Just go sit beside a river for a weekend by yourself. God desperately wants to connect with you. And He will. If you are willing. There is no prescribed way. But if we truly seek Him we will find him! I had a two-hour wait in the Münich Hauptbahnhoff. It’s been a crazy place the last while, I hear. 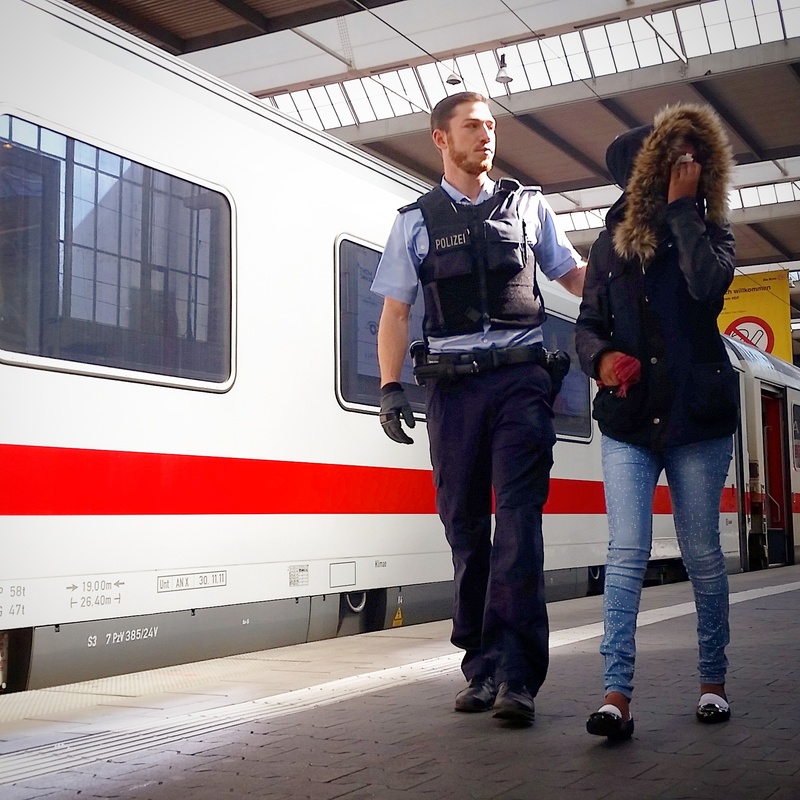 Yesterday 10,000 refugees arrived by train. The numbers are incomprehensible and staggering to me. I sat down on a nondescript bench by myself and got lost in my own thoughts. And then a group of middle eastern refugees sauntered up and sat down on the benches opposite me. But there wasn’t enough room so they filled up my bench and sat next to me. Not that I minded, but I considered moving instantly. Not because I dislike refugees. But because of the smell. It was not the smell of unwashed bodies, but the distinctly unpleasant aroma of someone who didn’t make it to the bathroom in time. Well, that’s putting it mildly. Let’s assume this happened, but of course there is no other set of clothes so we just make do. But I couldn’t move. I mean, what would that say to these poor people who have lost everything. You sit down beside someone and they get up and leave. In reality there is probably not that much pride left, but still it has to sting. So I stayed. And even engaged in some conversation. Not that either one of us understood anything. Sitting on this bench with a group of brown-skinned young men was really interesting. Several trains arrived and passengers disembarked. Hundreds and hundreds of people walked past us and I got to watch their reactions. Some people walked by, gazing straight ahead. Old ladies especially, would walk very slowly and almost stop, offering giant smiles. It warmed my heart. But nearly everyone watched us out of the corner of their eye as they walked past, careful not to make eye contact. The look was not resentment or mistrust. It was simply curiosity. Who are these people? Where are they from? What have they experienced? You see, I was sitting in this group of people. I felt like it was an honor. I am a bit dark skinned myself, and with my black hair I melted right in. 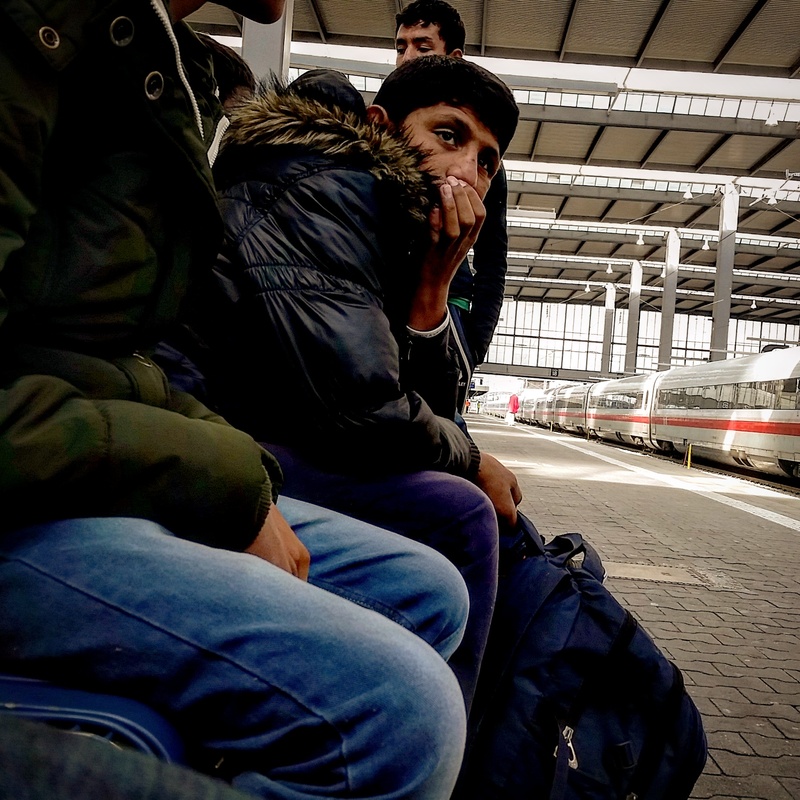 I heard people say flüchlinge [refugee] when they walked past. As far as they were concerned, I was just another refugee in this crowd. After all, I was not dressed sharply. In fact, I was actually quite grungy looking. I thought it was a really nice morning. Granted, it was a bit chilly. But these young guys were shivering violently, being unaccustomed to such weather. It was a really deep moment for me to identify with these people. To be treated by society as if I was homeless. I looked into the eyes of these young men. Eyes wide with fascination at this strange world. But also eyes that were deeply haunted by the pain, death and suffering they experienced. 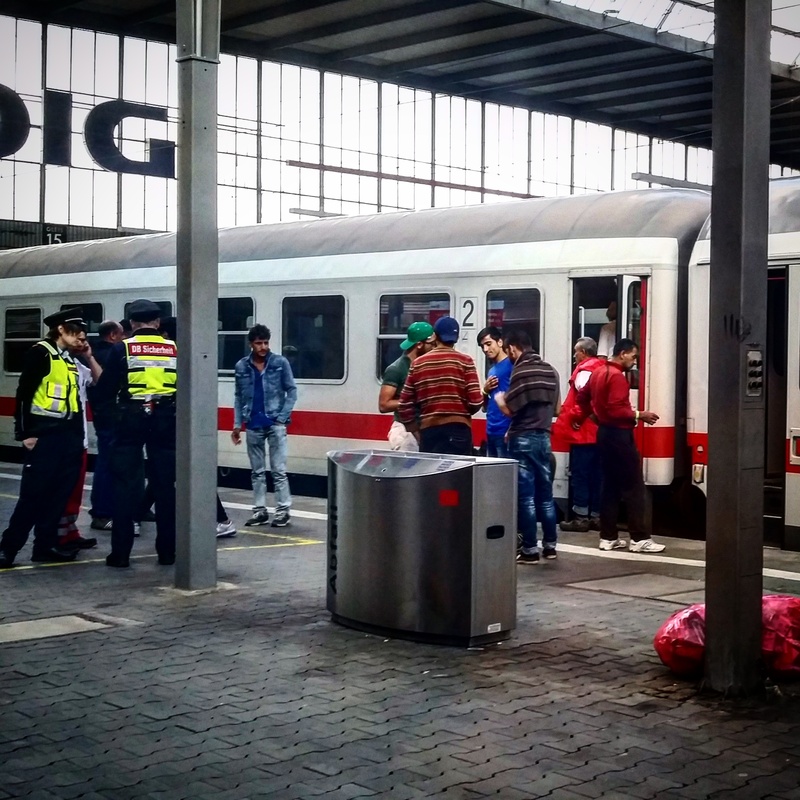 When I left the group for my train ride to Budapest, I felt embarrassed. I had everything. I could just leave. They couldn’t. A train pulled in from Budapest. It was quite a long train. And the entire train was filled with refugees. Dozens and dozens of police formed a human wall. News reporters stood on ladders behind them, trying to get pictures. The corridor teemed with volunteers in neon green and orange vests. Some of them were crying. Others had glazed eyes, and calloused faces. It just didn’t matter any more. I talked with a policeman and he let me through the line. I walked the length of the train studying these faces. It was so touching. Tears welled up in my eyes. But then I had to leave. 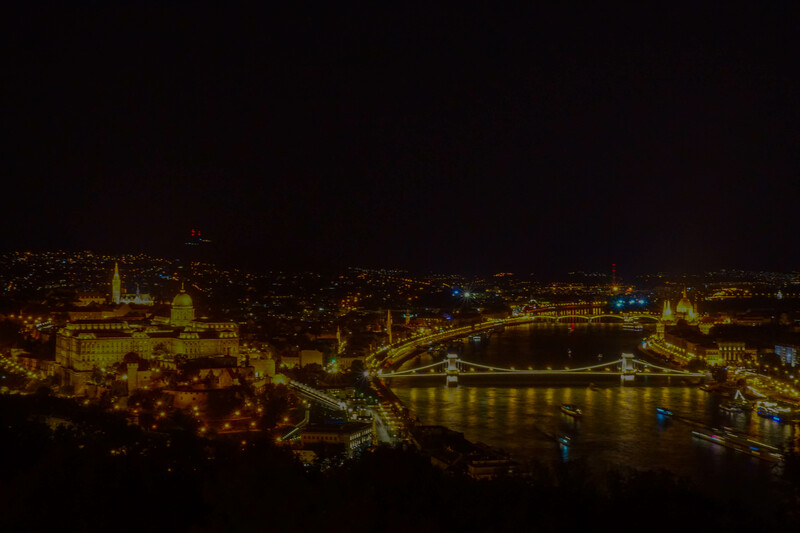 Budapest was calling. Somehow this made a deep impression on me. I realize Muenchen is a far cry from the pain and suffering in Syria. But still…I hear so much about these situations and read so much about them. To see it first hand and mingle with these people was an incredible experience. I hope I never forget this feeling. But then arriving in Budapest there was so much more. Unlike what the media portrays, I was not faced with a million angry people. But there were hundreds and hundreds of people camped in tents and sleeping bags in the train/metro halls. Really it was too much for words. So I won’t try. I got up at 5 in the morning, packed my bags, ate some muesli with fresh raspberries and shouldered my bags. The morning air was crisp and the sun was threatening to break through the clouds. Daylight comes quite early here and it felt unusual to be walking the streets of Tromsø while it was entirely deserted. 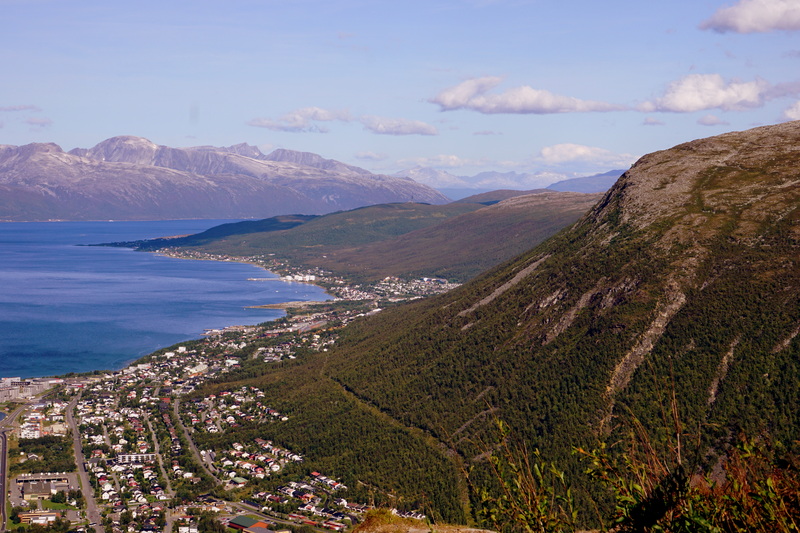 I walked over to the bus stop that I needed to catch the #100 bus to Narvik. This bus was something between a city bus and a long distance bus. You could simply flag it down anywhere and get on, or wait at a designated stopping point. It had room underneath for my back pack, and a comfortable reclining seat to let me snooze for a bit yet. 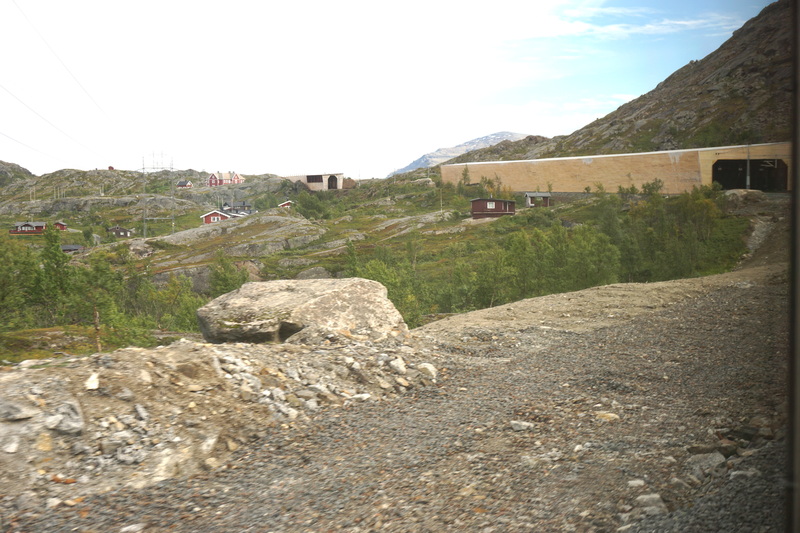 It was about a 4 hour ride with 158 designated stops before Narvik, the vast majority of which we did not stop at. 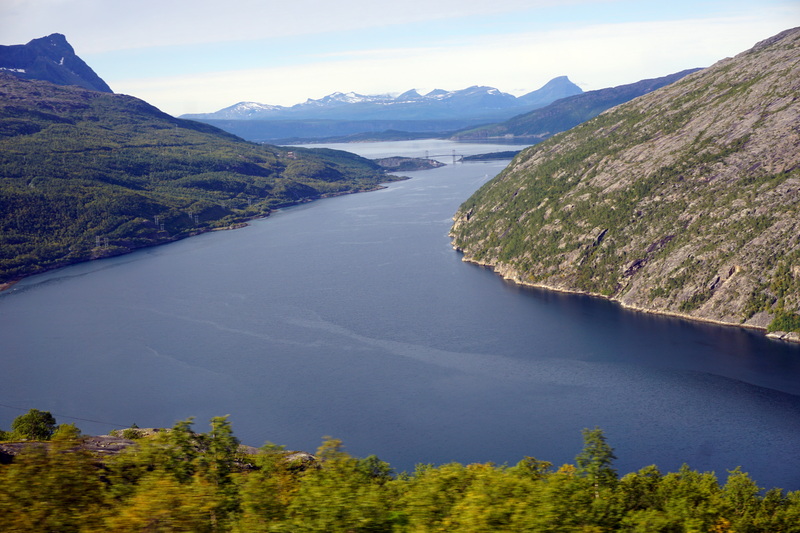 I wonder if the day will ever come that I am not in complete awe as I travel around Norway. It was the same story all over. Large, imposing, snow-capped mountains. Towering, bald-faced, rock cliffs that make a person cringe. Waterfalls cascading off these or crashing down through the mountains. Icy fjords reaching their fingers deep inland from the Arctic Ocean. Feverishly, I tried to take it all in. The ride down was quite uneventful. 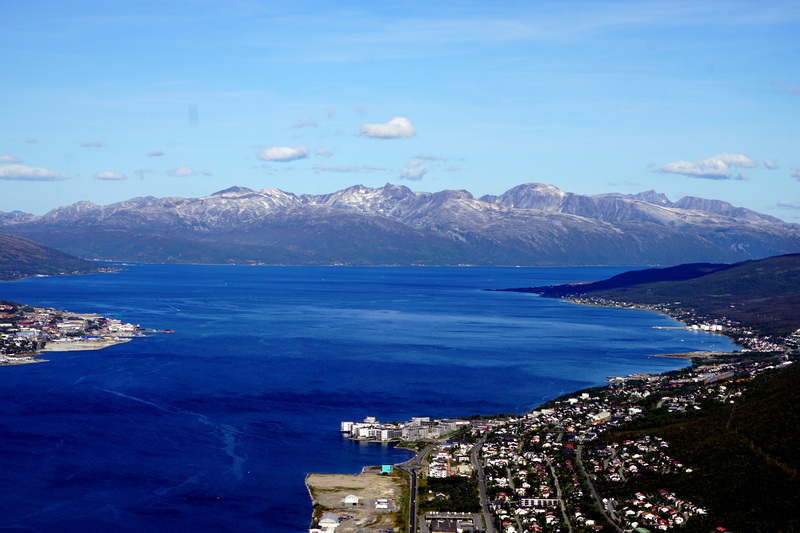 I was dropped off right in front of the Narvik train station where I had another two hours to wait. I went outside and sat at a picnic table in the warm morning sun where I made and ate a sandwich. Some of that delicious, freshly sliced Norwegian bread [my German friends snicker that I think Norwegian bread is good] that I buttered down with real butter, some spiced ham and Gulost cheese. I boarded the train which was quite short and had only one car bound for Stockholm. 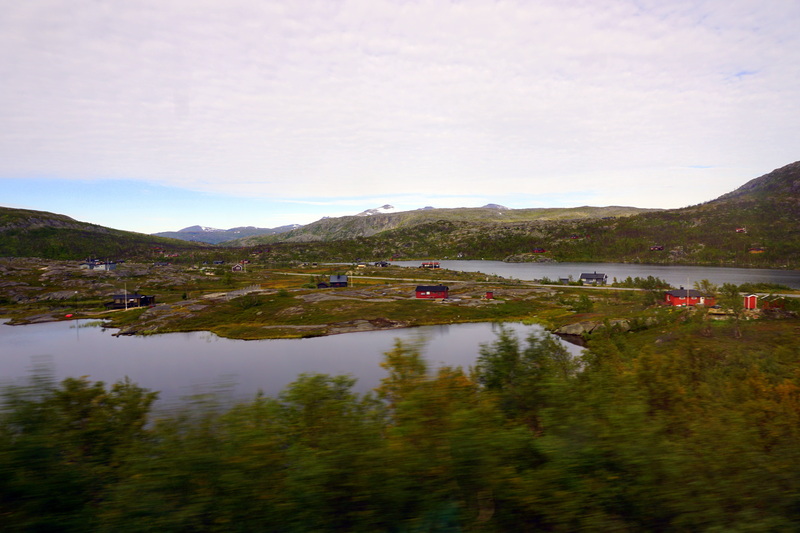 The rest of the train was going to Luleå which is about halfway down across Sweden. 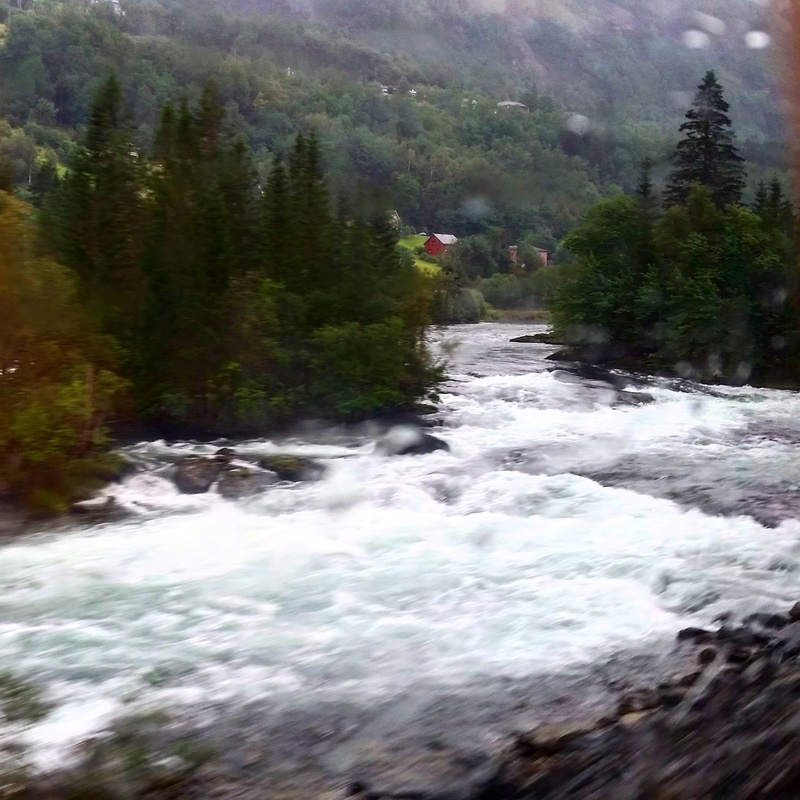 This was an amazing train ride. I thought what I saw this morning on the bus was incredible, but the view from the train was so much more. 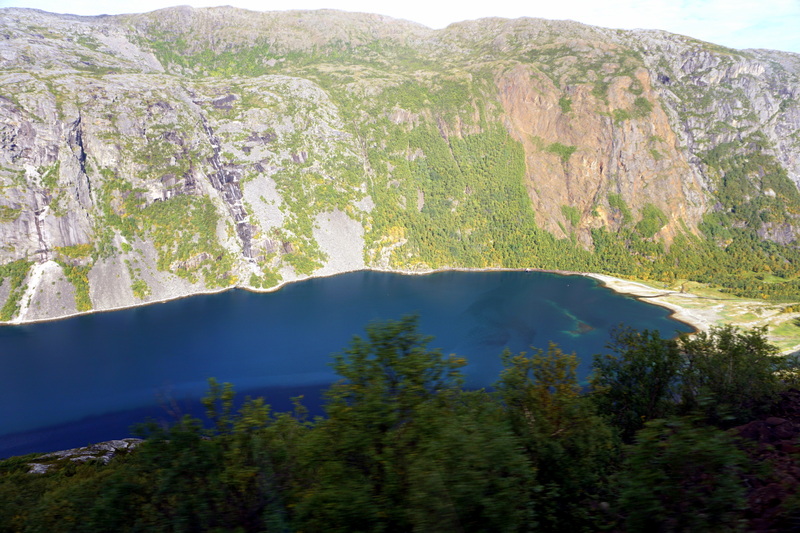 While the bus snaked around the bottom of the mountains, the train went right on up and boldly cut a path around these, precariously hanging to the side while we looped around mountain after mountain with fjords far below. I stood at the window with camera in one hand and Go-pro in the other. 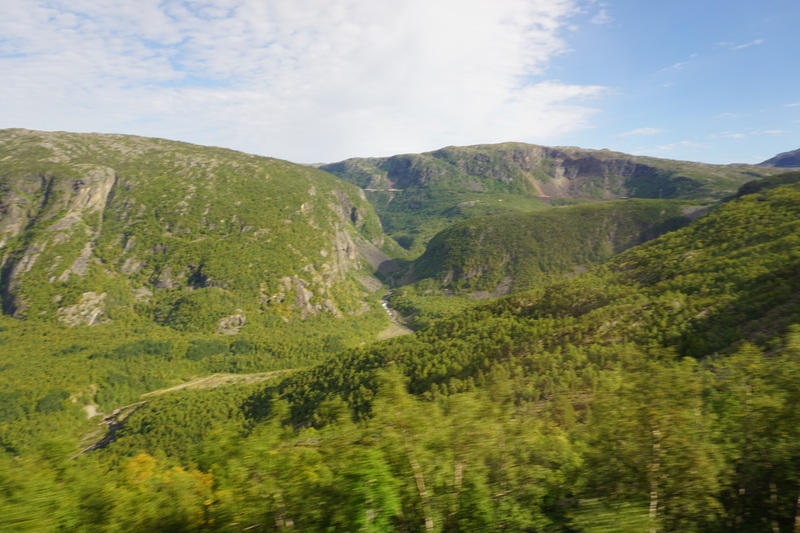 About an hour into the trip we got to the Norway-Sweden border high up in the mountains. Up here there are no crazy, heart-stopping, hair pin curves. 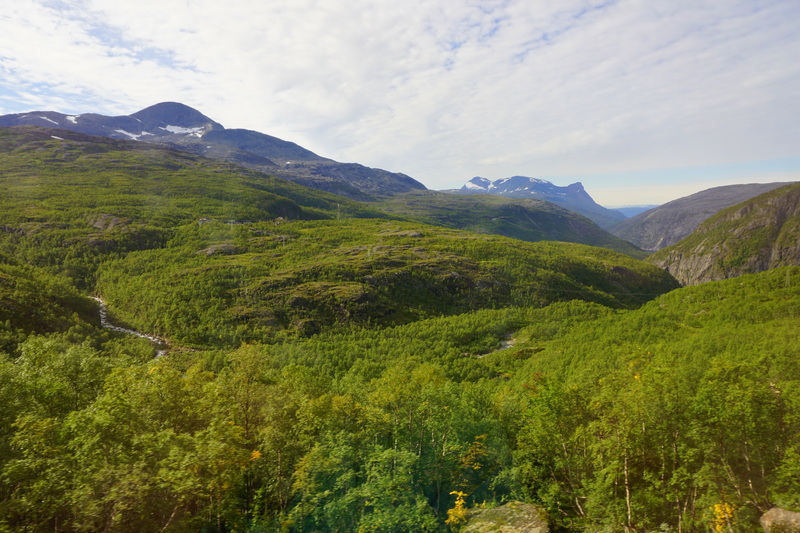 Only tundra covered plateaus with rocky peaks and giant rock strewn about. It looks like a desperately cold and uninviting place in the winter. I cannot imagine how high the snow would pile. Because of the wind [and perhaps other reasons] there are miles of long wooden sheds on the top of the mountains that the train runs through. It is an electric train so there are wires strung along all the way, even through the sheds. I find it quite fascinating that the Swedes have this infrastructure so far north, and yet in the US we think that a train running from NYC to Toronto is so remote that we have to switch to diesel engines. A lot of people got on at Kiruna. 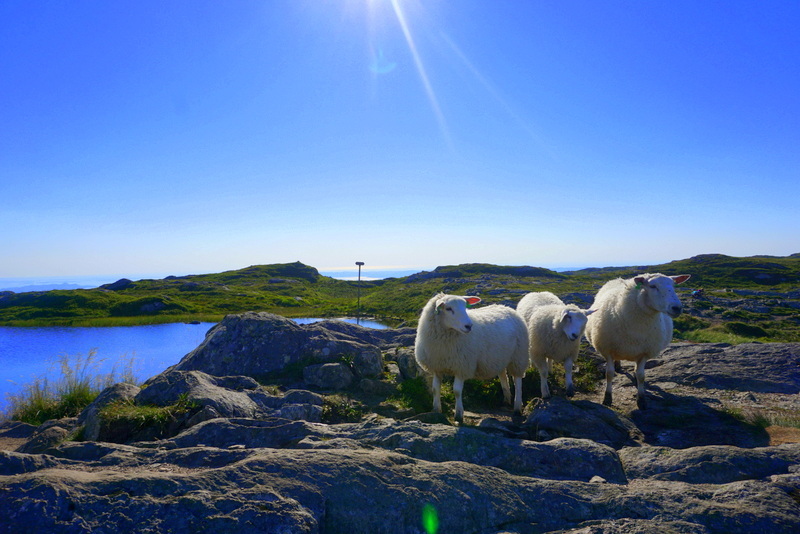 It is widely known and celebrated as one of the northern most posts of Sweden and I am genuinely surprised that people just believe it. Are they not aware that you could stay on the train another three hours? Interestingly however, practically every one of these dozens of people were wearing huge body back packs, hiking shoes and rain gear instead of the standard travel wear. 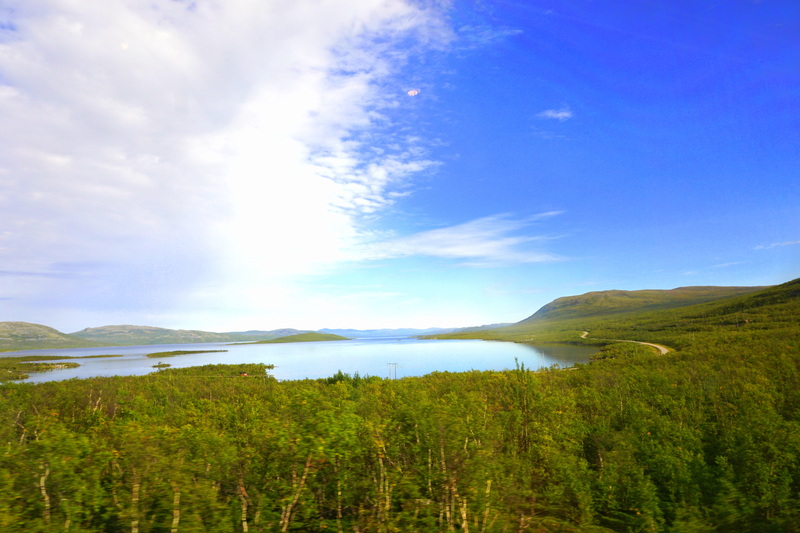 I would recommend anyone who comes to Narvik to take the train to at least Kiruna and back. The scenery is unbelievable. And it is so incredibly cheap. My ticket from Narvik Norway to Stockholm Sweden cost a paltry $42.80. But we went on. Towards evening the tundra started fading away and gave room to evergreen trees. Relentlessly the train carried on sweeping me ever further south. I lost track of time. 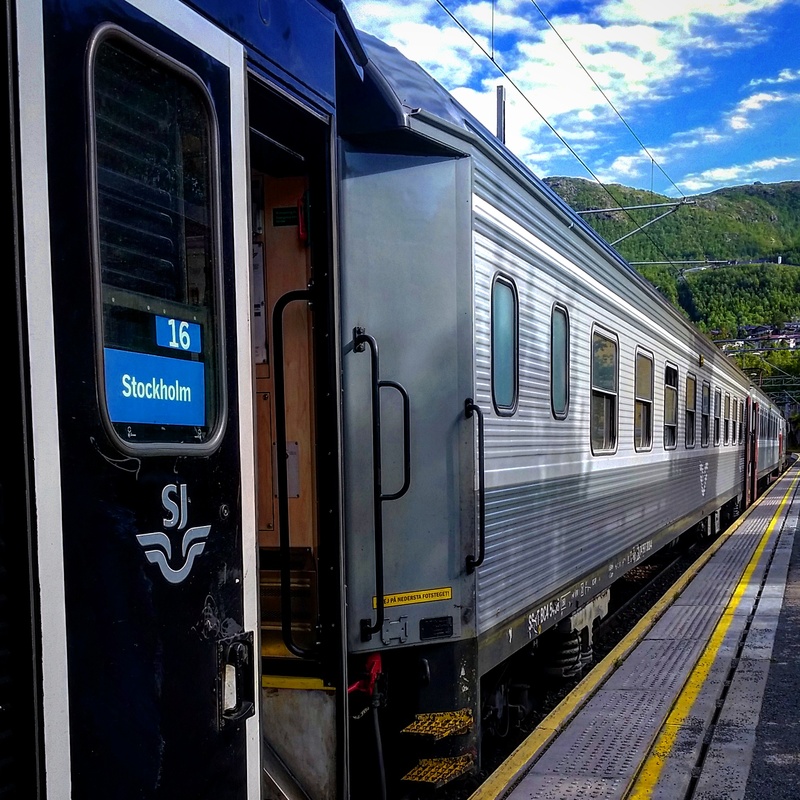 But at some point we stopped at Boden and the Stockholm car was disconnected and attached to a Stockholm bound train while the rest went on to Luleå. I had a table seat so reading and writing was pretty easy and no one sat beside me throughout the whole journey so in the evening I got out my inflatable pillow [what a life saver] and cramped myself into a short position on the double seat. I managed to sleep for about 6 hours. In the morning I got a cup of coffee from the restaurant car. It cost 20 SEK which was reasonably cheap and I had my own creamer along. The coffee was strong and dark. So dark that it actually felt like it was a bit syrupy. Oh but the flavor. When it got to my lips I shivered and tingled with delight from head to toe. I got into Stockholm a bit before lunch, and my train out wasn’t till evening. I was really excited to be in this great city for a day and promptly headed to my favorite cafe, Espresso House for some breakfast. I spent the day going to a few of my favorite places and then watching the sun slide down in the west and watching planes come down into Arlanda. 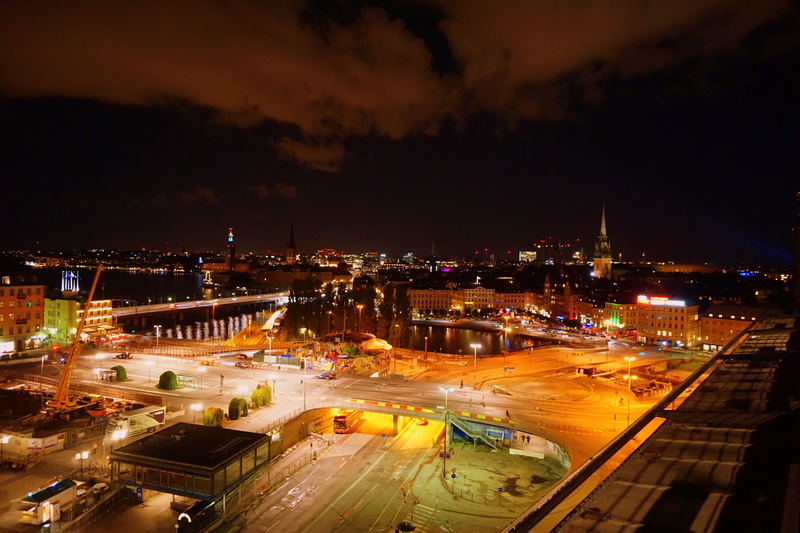 Around 11 that evening I walked back to Stockholm Central Station where I got on another train bound for Lund Sweden. I sat beside a pleasant young middle eastern guy and promptly fell asleep. When I woke up, he had moved across the aisle to sleep on a newly emptied double seat, so I laid down as well. I was rudely awakened at 6:30 by an announcement that we were arriving in Lund, so I had to get off. I waited a quick 10 minutes for the Copenhagen bound train to arrive and jumped on it. I got my morning coffee here, and boarded a train for Hamburg Germany. I sat across from an interesting young man from Australia who was traveling for a year. We had great conversations and visited with the young Libyan who sat across the aisle. When the Libyan saw the conductor come he scuttled into the toilet where he would stay silent and well hidden till the conductor had passed along. He regaled us with tales of how über rich Libya is and how the money flowed. I guess when you have that much you want to hide in the toilet so you don’t have to pay the conductor! 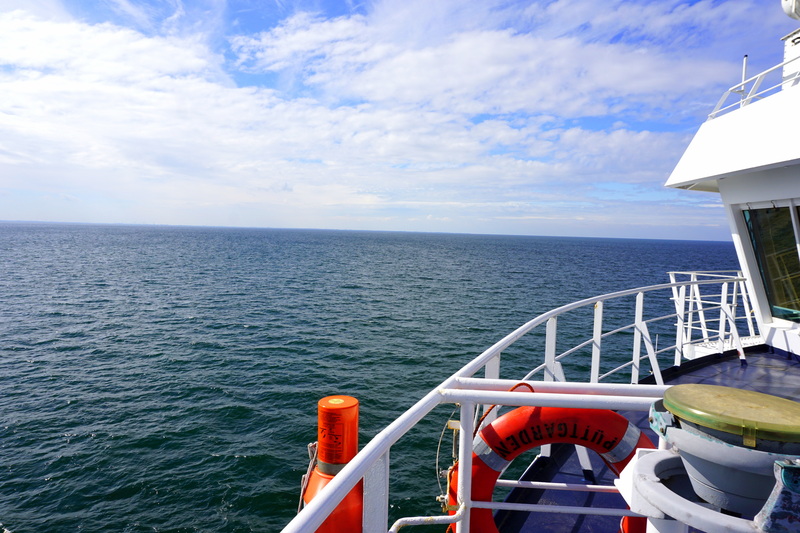 My favorite part of the journey was when we got to the end of Denmark. Literally. I am glad we didn’t just drive off into the sea. Instead the entire train drove into the bottom of a ferry and all passengers got off. I went to the very top and spent the 45 minute ride feeling the salty ocean breeze blow through my hair. The train then drove off on the German side and went on to Hamburg. I had a 45 minute layover in Hamburg and then I got the sleek red and white ICE1081 to Würzburg. Here I had a one hour layover and I caught a red regional train to Heilbronn. What a relief to be here. To have a shower. To wash my itching hair. Clean clothes. Ahhh. After all that was over 2000 miles of traveling through 4 countries for 3 days and 2 [miserable] nights. I would be here for just a few days till I would continue. And let the train carry me eastward toward where the sun rises. Eastern Europe, are you ready? 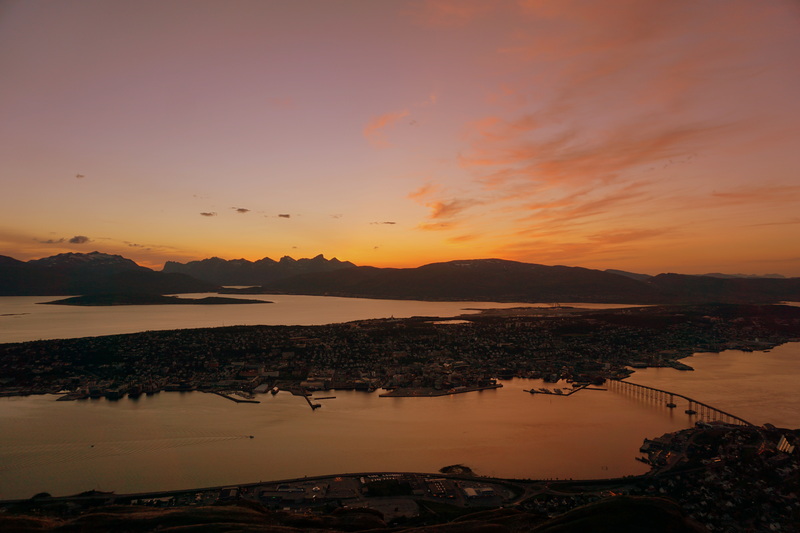 Tromsø. A wild place in the far north. Well, that is I used to think it was the far north. Now I know it’s not really. Maybe that would be Svalbard. 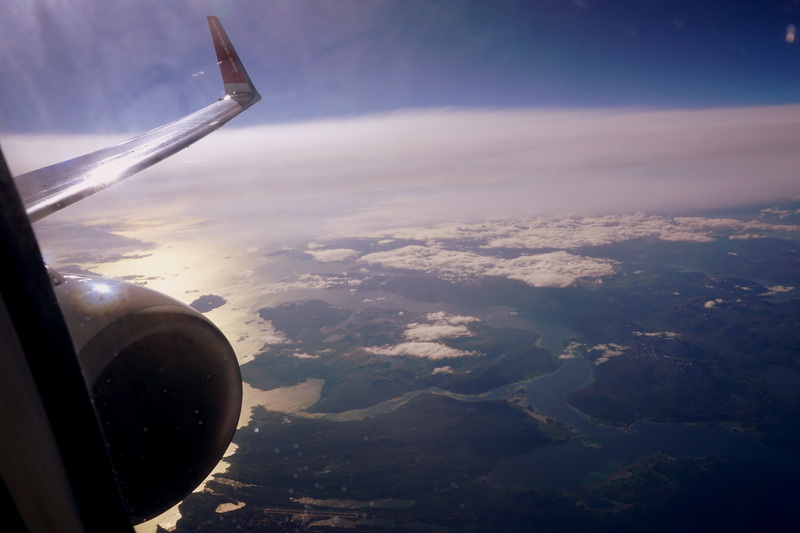 The flight from Oslo to Tromsø was incredible. 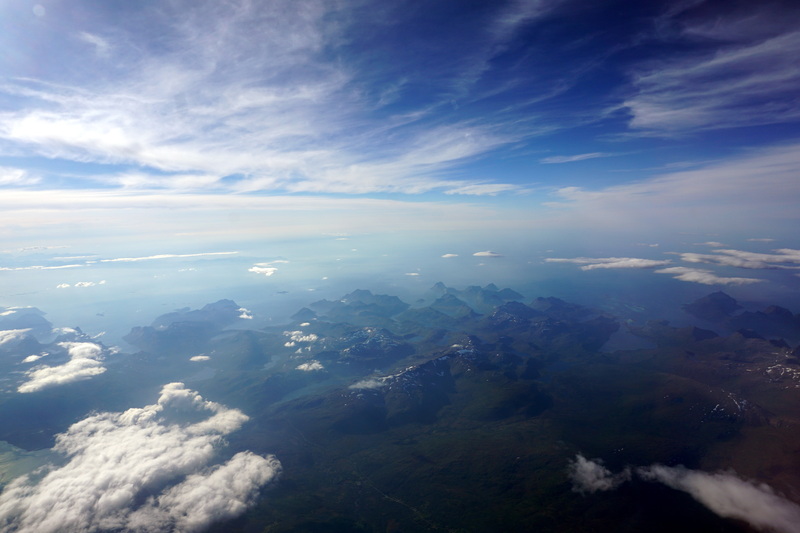 Snow capped mountains, towering rock walls, barren peaks, and deep fjords all clearly visible from the plane. It reminded me of J. R. Tolkien’s books.The scenerey was unreal. I arrived at the airport and took the bus into the city center all the while practically pinching myself to see whether I am actually here and whether this is real. I stayed with several friends here and had a nice time. I was quite independent and went out every day. 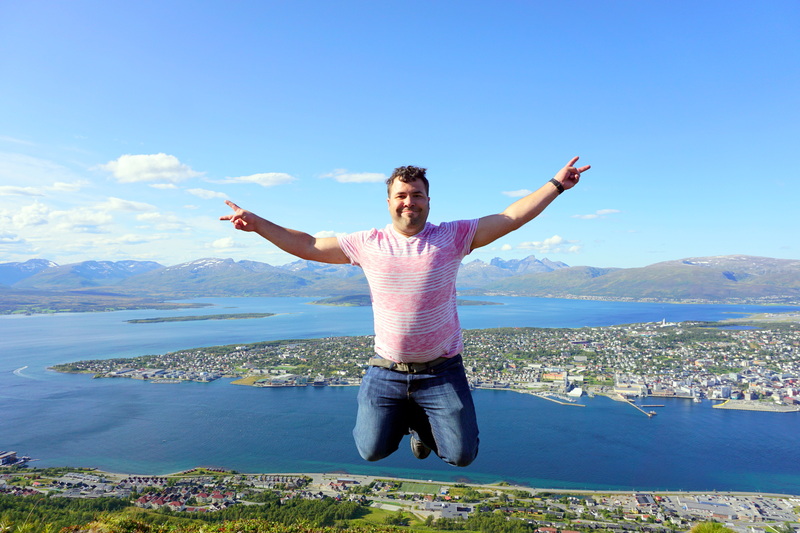 I really enjoyed Mount Storsteinen and kept going up for the view. 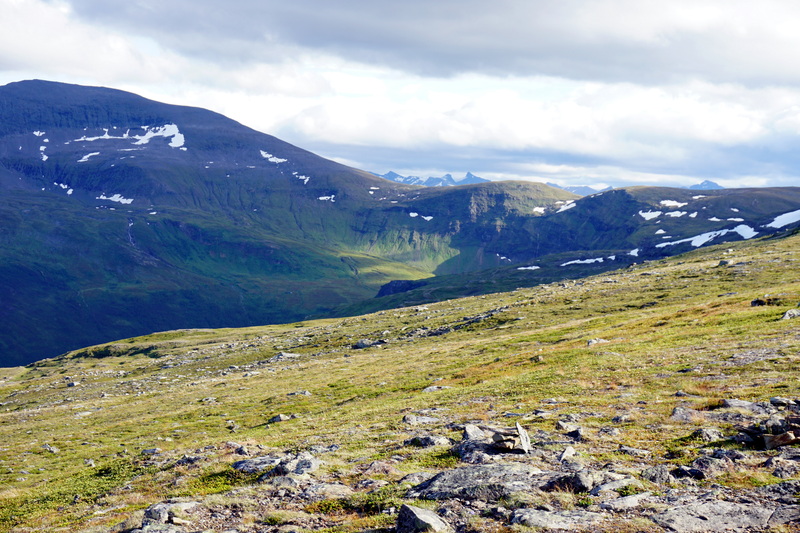 I did some hiking in the mountains there by myself and ventured up above the snow line. It was August, but it was frigid. The wind was probably the strongest I have experienced anywhere. Walking into it, I had to lean significantly just to move ahead because the it was strong enough to keep me from falling, even pushing me back a bit at times. Crawling up was a bit treacherous but I kept my footing on the narrow rock ledges. Part way up I found a nice rock to set on and spent some time meditating, praying and hearing from God. It was a very special time. At the peak, I thought I wouldn’t be able to breathe because of the wind, so I stayed for only a few minutes. Going down was tricky because the wind kept pushing me and making me take bigger steps than I anticipated, which was dangerous because sometimes the ledges where I stepped on were only a few inches wide. 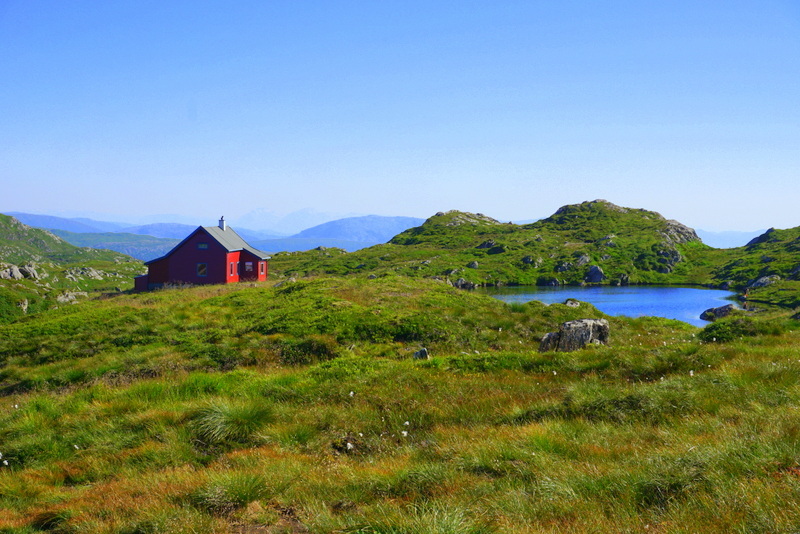 I walked up and down the islands along the edge of the fjords that reached in from the Arctic Ocean. 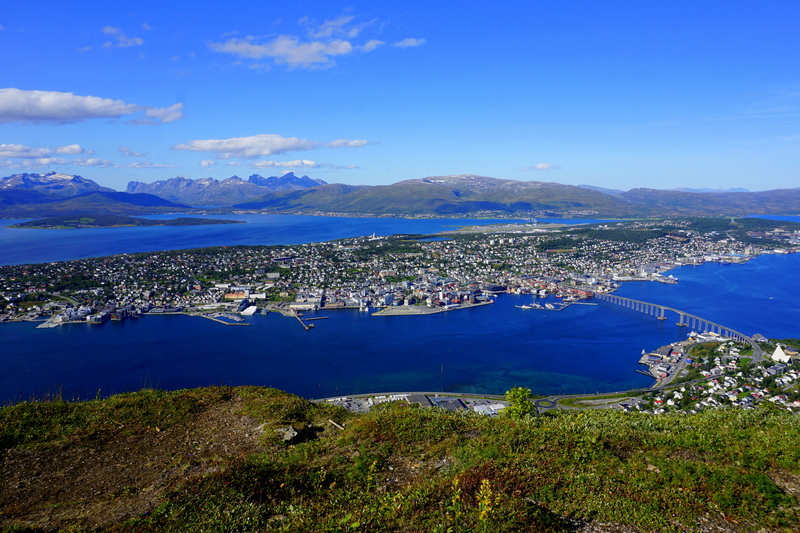 After all this city is 217 miles inside the Arctic circle. 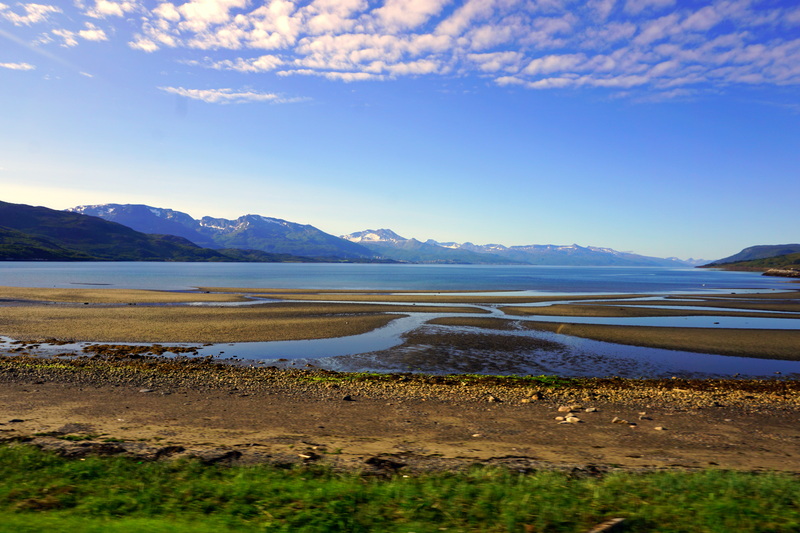 It has historically been the launching place for Arctic expeditions and northern whale hunting trips. On Sunday I found a rocky beach overlooking some snow-capped mountains and spent the time reading and meditating while strong waves crashed on the rocks spraying water everywhere. 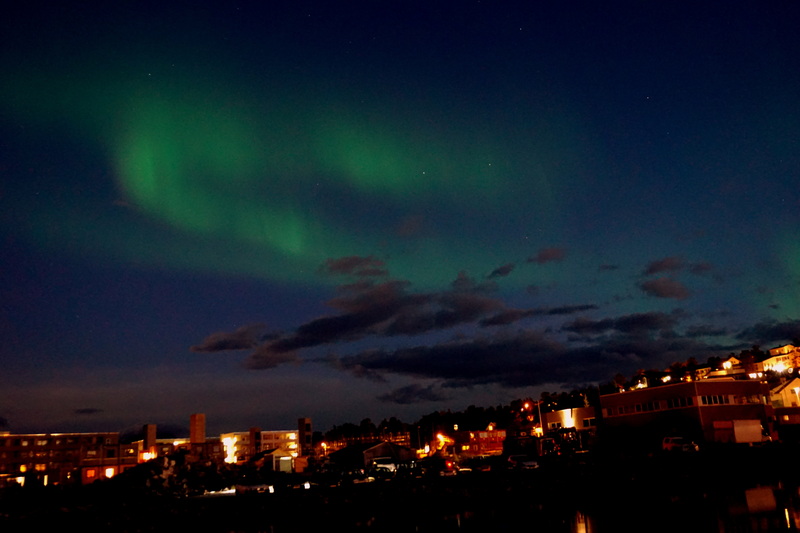 Another highlight was seeing the northern lights again. 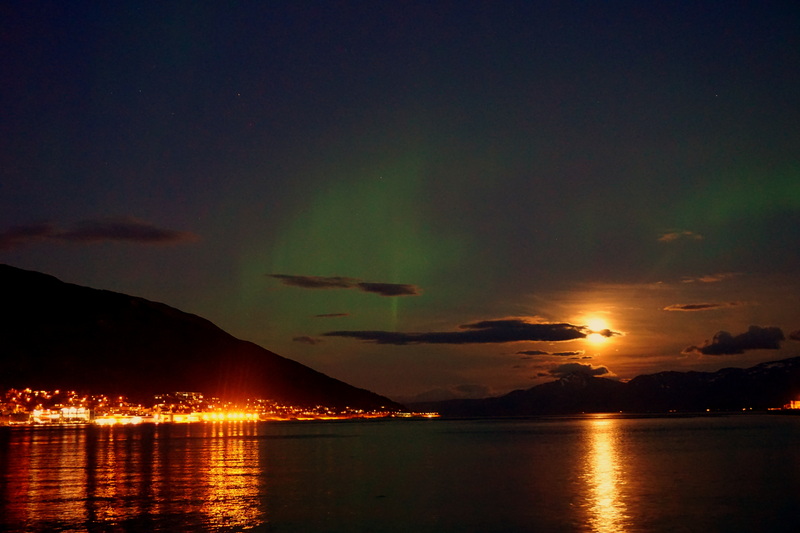 I was not expecting this in August and it was a real treat to see the strange green lights dancing overhead while the bright moon rose from behind a bank of clouds next to the mountains. I was outside for hours admiring this phenomenon. This time of the year darkness comes around 10:00 and daylight at 4:30. It is so different from when I was here last December and it was dark the whole time, or in the summer when I would Skype with my friends and there was broad daylight all night long. 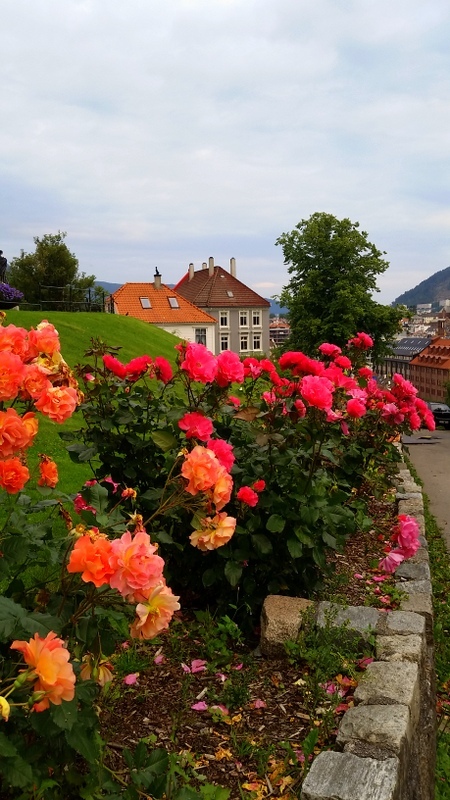 I have experienced Bergen again and it remains one of my favorite cities. I had a very uneventful flight over which is definitely a good thing. On the bright side, the young lady who sat next to me on the way over was also going to Vladivostok and taking the train across Siberia. It was like the first time I met someone else who wanted to do this. I rolled my eyes. Nothing like fellow Americans to embarrass you when you are trying to act all cool and nonchalant! The first day I just walked around town, especially in a nice residential section. I am intrigued afresh with the cute quaint houses each time I come. The stately wooden houses. The pastel colors. The absolute barrage of flowers climbing from every window box. 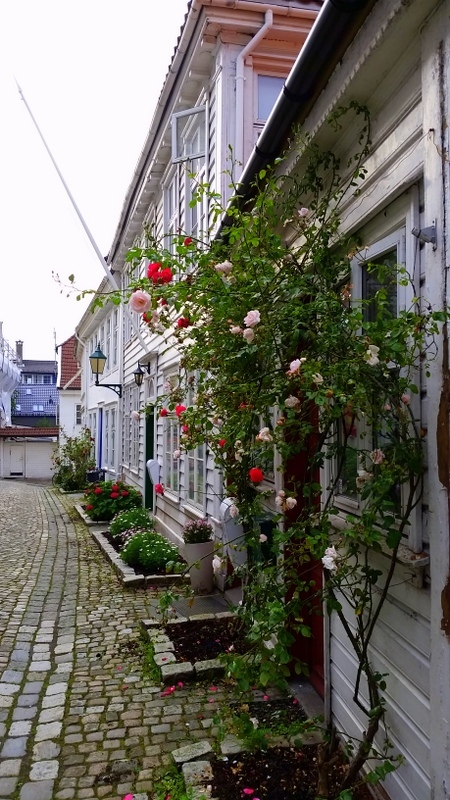 The winding cobblestone streets. The stairs connecting the streets catered especially to the pedestrian population. 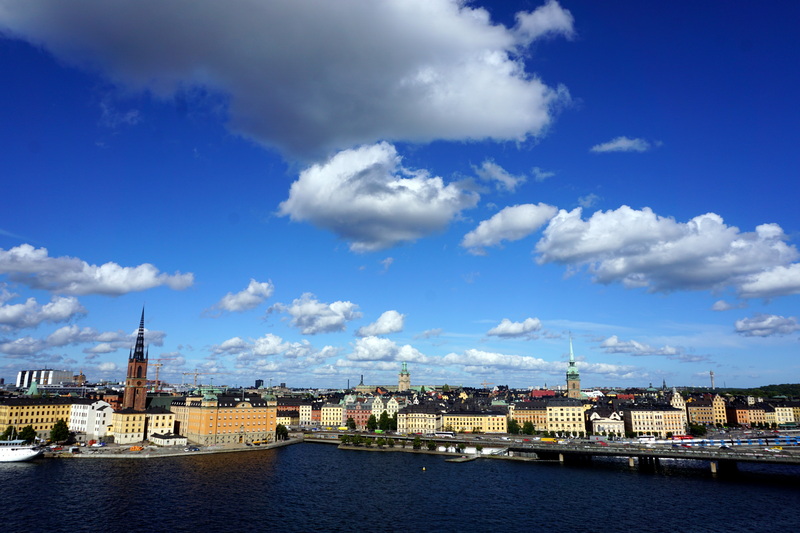 I stayed with my friends Numi and Sara who have a stately apartment on Nygårdsgaten. It’s a roomy place with a nice porch on the back to sit on and just down the street from the grocery store Rema1000 which I visited immediately. I love shopping at foreign grocery stores! On an interesting side note, Numi mentioned that a man with an ax broke into a convenience store next door while we were walking home. The highlight was a hike that we did across the mountains. 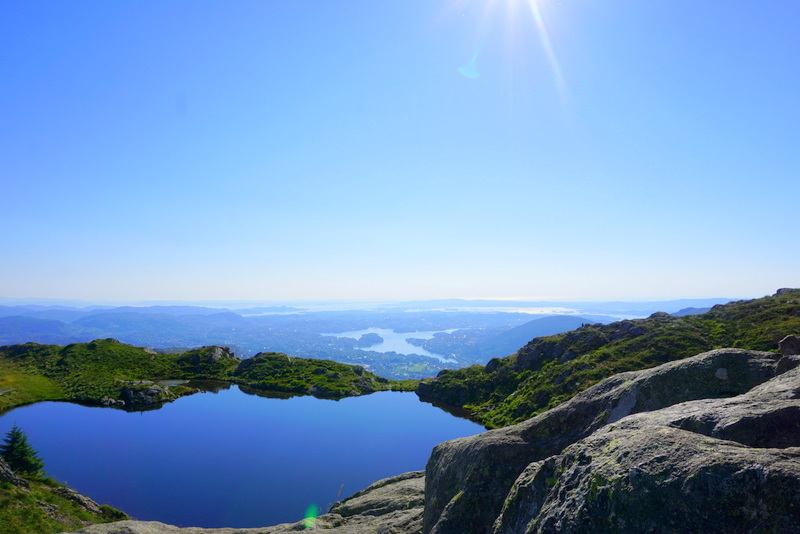 We hiked from Ulriken to Fløyen. Standing down in the city and looking at the peaks, it doesn’t look that terrible far. But it’s about 10 miles along the path and some of this is climbing up and down rock walls. 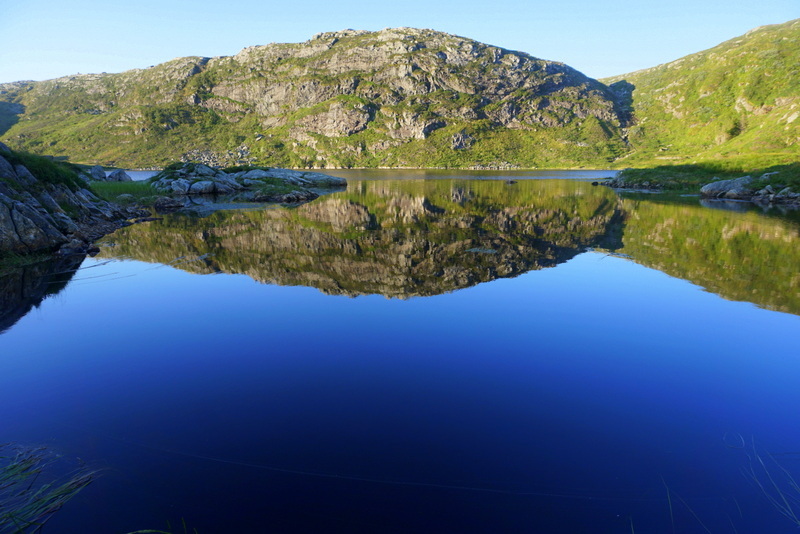 Not to mention walking Ulriken and back down Fløyen. It was a wonderful hike and miles of it was along semi flat plateaus with brilliant, soft, green grass and sheep scampering about. First you walk in the complete opposite direction that you really want to head and loop back around several other mountains. 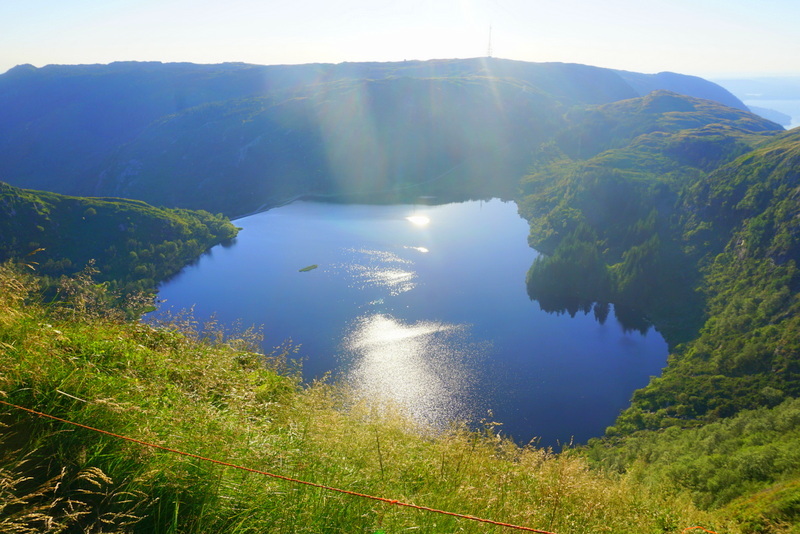 Along the way you see lots of deep blue lakes that look so inviting. But they are freezing cold! We packed sandwiches, coffee and water and had the most pleasant of times. 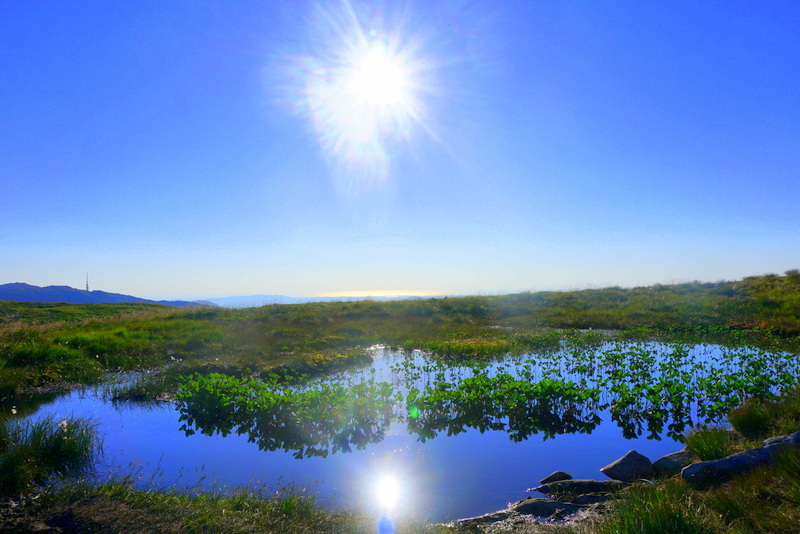 I felt so incredibly fortunate to have a warm <<sunny>> day! 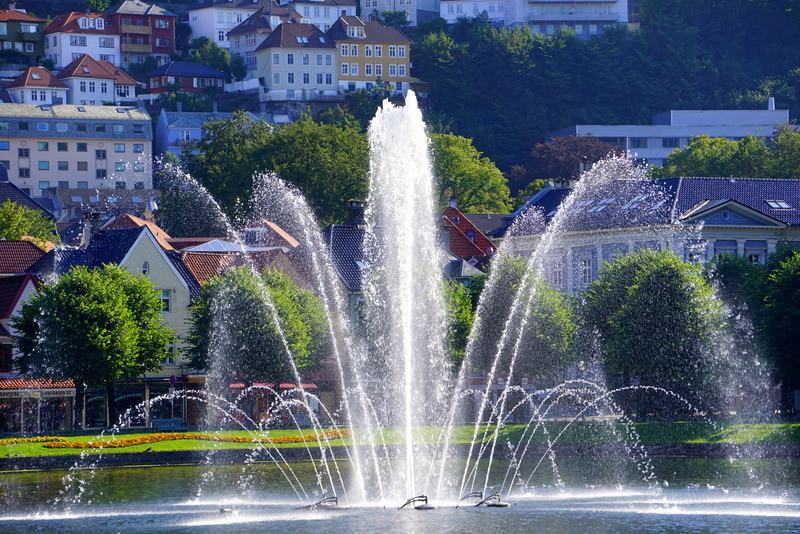 On average it rains 231 days a year in Bergen. 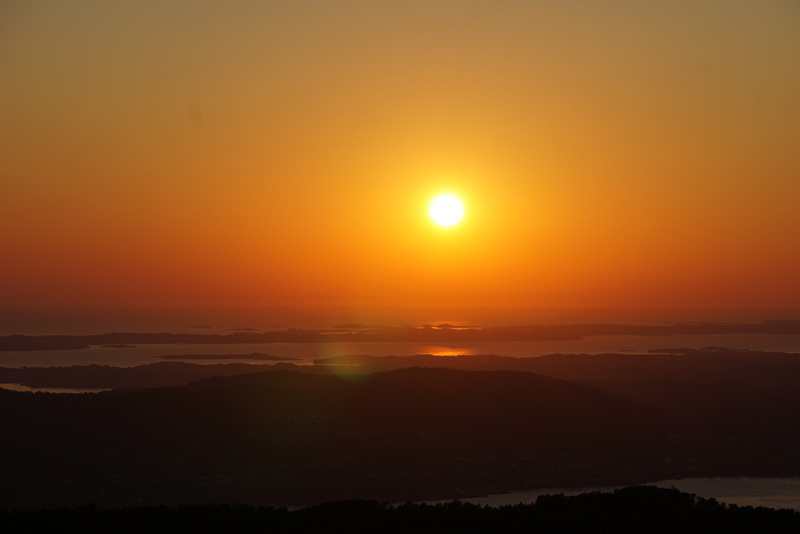 As we approached Fløyen the sun was starting to go down. 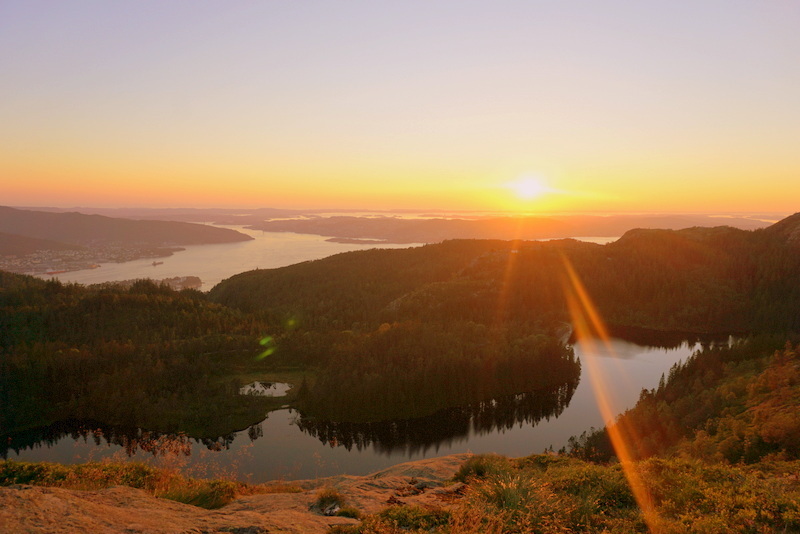 I found a beautiful spot on a cliff and stayed to watch the sun slide down while the others went on. I watched one of the most breathtaking sunsets of my life before darkness fell. 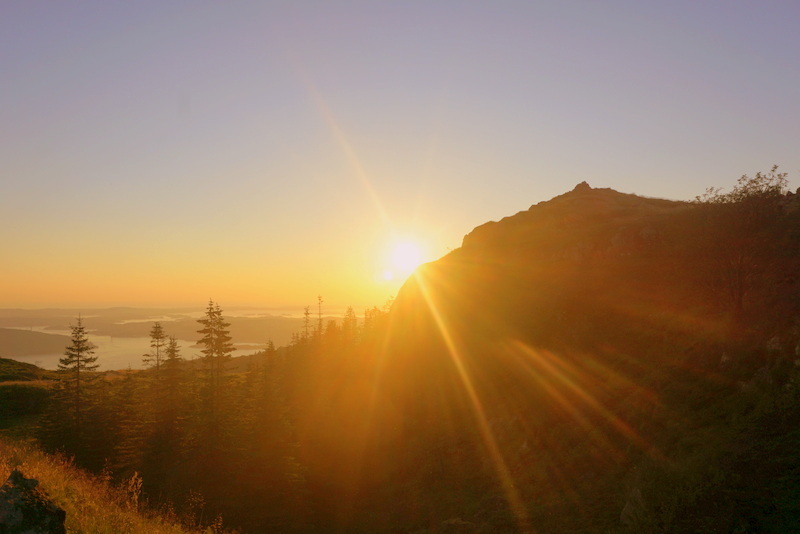 I packed up my gear and headed down the mountain, as I realized that it was getting dark, and I did not know the way back, nor did I know how far it was. That was also the moment I realized I forgot my head lamp and then I heard a wild animal scream. More adventure! All is well that ends well. Other than a 90 minute walk in the darkness and being stalked at length by a stranger, nothing happened. After about a mile of being followed in the darkness I stepped off to the side and pretended to be busy looking at the forest [in the darkness] while he stood 50 feet behind me. After a while he came forward and confessed he didn’t know the way to the city and had planned to follow me. Another highlight was the evening I went fishing with Numi. He is a tall lanky guy who thrives in the outdoors. 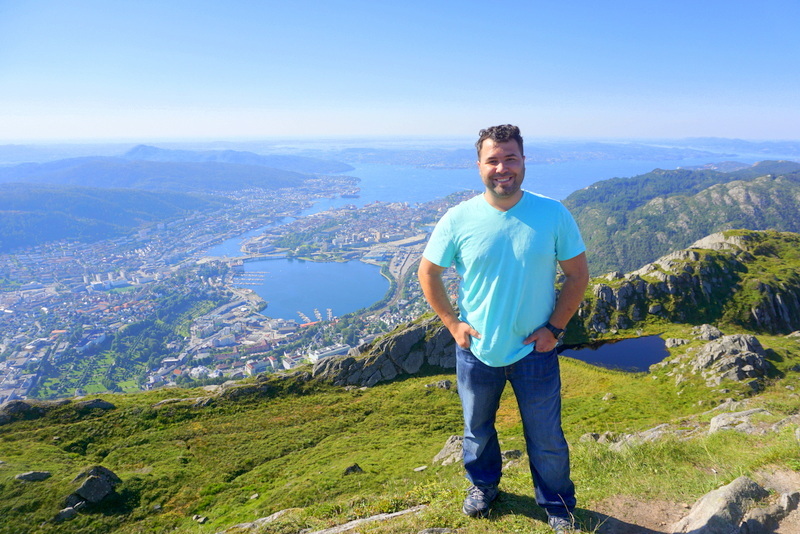 He has trekked all over Iceland and is a real outdoorsman. 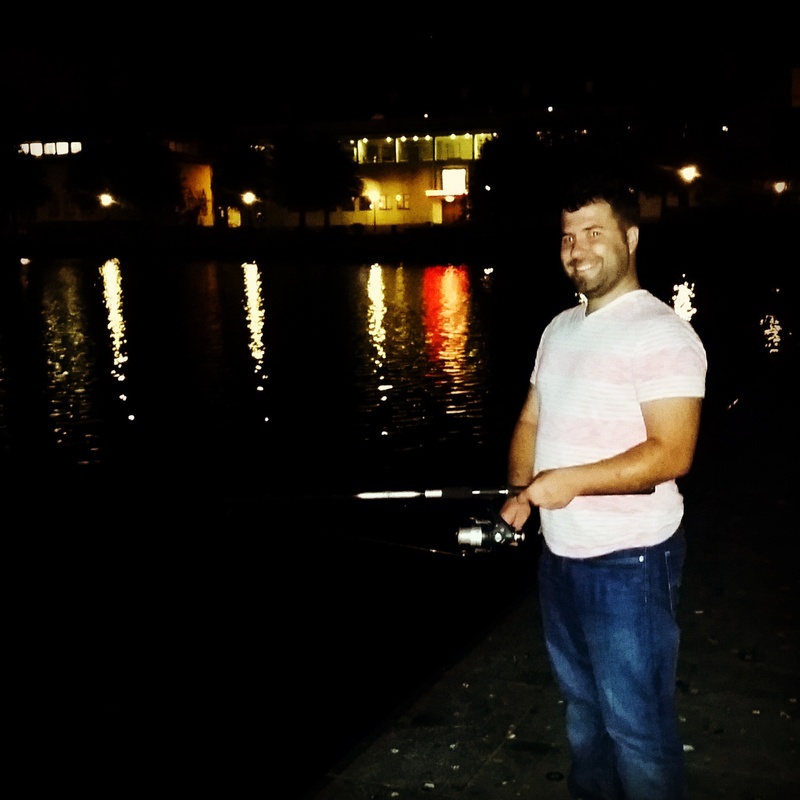 But there were no salmon infested-grizzly stalked rivers in Bergen so we went to the large pond in the city park and fished for trout. It was different. The tram ran past about 20 yards away. City busses churned up and down the streets. Curious passers-by discreetly stared. The fishing was great. The catching wasn’t quite as good. And then there was National Waffle Day. To celebrate I went to Bergens über cool hipster Bar Barista Kafe and had their amazing waffles that were stuffed with brown cheese. 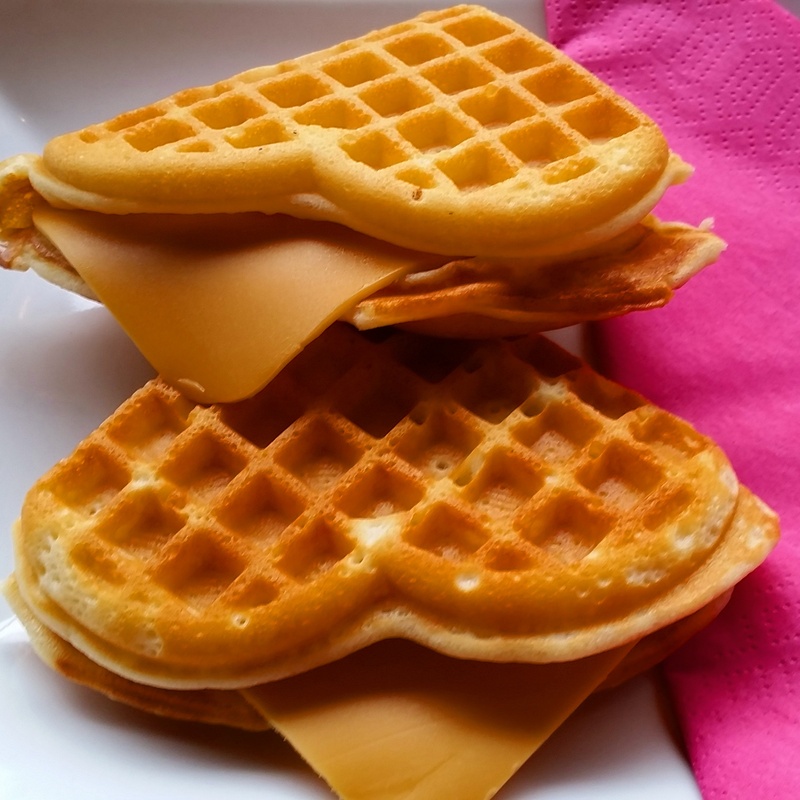 Brown cheese is a delicacy in itself, and when stuffed into waffles it turns into a fiercely scrumptious food. All good things come to an end though. 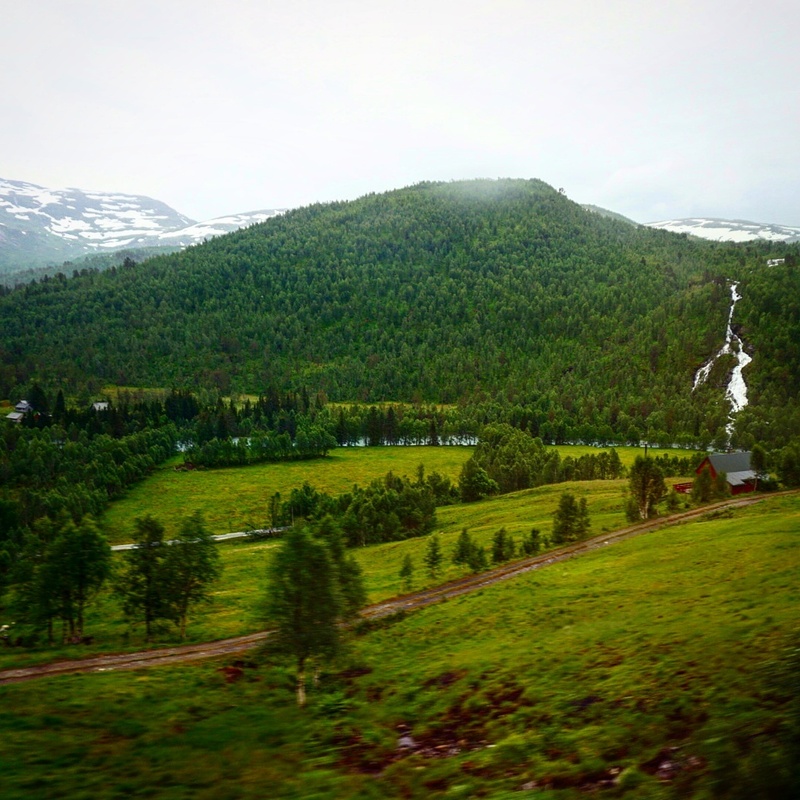 I boarded the train for Oslo and headed on. The train ride between these is amazing. Miles and miles of tunnels. Glaciers. Raging mountain streams. Cascading waterfalls. And hundreds of stereotypical little red wooden houses. Ah, but it does one good to drink all this in. Its been about 140 years since Horatio Spafford penned the words to this old and much-loved hymn. For years it’s been a favorite song of mine. Do we know what this guy went through? He was financially ruined in 1871 by the Great Chicago Fire. Several years later him and his wife and four daughters decided to take a trip to Europe. Last minute he had to stay back and the ship sank. He lost his four daughters. Then they had another son and he died at the age of four. Their Presbyterian church regarded their tragedy as divine punishment. Horatio was a nineteenth century Job. It put me on a search as I explored my feelings and faith. Yes, I am enjoying life. The last few years have been an exceptional springtime of the soul. I have been happy. But my thoughts went back a bit further to those days of confusion and hurt. When there was not springtime in my soul. When it seemed like the very sun was setting in my soul. When I was 21 years old I had to decide if I wanted to live in the comfort and happiness of my family and friends, or whether I would boldly follow God into the unknown. Into a world and culture I knew nothing about. It was a hard decision but I answered the call of God. I was deeply hurt at losing my family.But still I said, “It is well with my soul.” Then God provided countless dear friends from all over the world that became like family. Just to show me that he cared. As if that weren’t enough, he restored the relationship with my family to a better place than I could have ever imagined. But the time that it was really hard to say was when I lost my friend Daniel. You know how sometimes [they are rare] you meet a friend who just gets you? That was Daniel. He knew so much about me but just accepted me. We were best friends. And then one day he was gone. Never again would I see his smiling face, hear his bubbly, contagious laugh or sarcastic remarks. That was the end. And that was hard. I admit I questioned God for months. “Why,” I demanded to know. Sometimes it took me most of the day to say it. But every day for months God asked me these questions. And every day I struggled through them. Every day, by the end of the day I would pause before God and say,”The Lord gives and the Lord takes away. Blessed be your name. And yes God, your grace is enough.” It is well with my soul. Voice of darkness go. You are not welcome here.